Pilgrim Center and Moon Beach have a long and proud history of providing meaningful camp events, retreats, and Sabbath at two very special places apart from the busyness and demands of the world. It is in these places where we slow down enough to appreciate nature, to listen to one another, and to hear God’s still, small voice calling us to live our faith at special places, but also in our homes, schools, and workplaces. Even before Pilgrim Center was established on this land, this was a sacred place to the Native Americans who lived in this area. Green Lake was a center of their community with abundant, clean water and fertile land. There are many sacred places on the Pilgrim Center property which give us a hint of our Native American brothers and sisters who lived here over 1,000 years ago, including several Effigy Mounds. Pilgrim Center, as we know it, was founded in 1902 with a gift of $1,000 to secure property on Green Lake where people could gather in Christian community for fun, relaxation, and faith exploration. Since its founding as the Green Lake Bible Institute, Pilgrim Center has evolved and adapted to the changing times. It moved from a separate corporation to a non-profit stock corporation which included a number of denominations. These faith groups worked together to provide for this program and to share the space and facilities to meet their individual and collective programmatic goals. 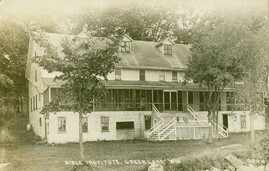 Over time other denominations moved away from camping programs, so the Congregational Church (a predecessor to the United Church of Christ) bought the stock shares and eventually owned the entire property. Although there is no formal ownership by other denominations, we welcome other denominations and members of other faith backgrounds to this place to join in community of faith to any of our programs. Our camps are places where we gather in community to hear each other’s faith story and explore our commonality on this journey of faith. Moon Beach was originally a family owned fishing resort. In 1957 the Evangelical Reformed Church in Wisconsin (one of the predecessors of the United Church of Christ), was looking for a camp where children and families could gather for recreation and renewal. The church found this beautiful property and secured it for a very attractive price. 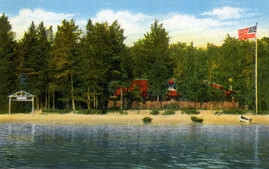 Moon Beach has all of the natural beauty of the Northwoods, and all of the charm of its history as a fishing resort. Cabins overlooking Moon Lake dot the shoreline, providing a stunning view and privacy for each family. Moon Beach is unique among most camps across the United States in the fact that we offer an extensive family camp program. Most camps only provide programs for youth, but even from the beginning, the vision for Moon Beach included families. Each summer we welcome families of all sizes and all definitions to be part of this unique experience and community. Some people who come to family camp grew up here with their parents and siblings, and now they bring their families to camp. Of course, every week we warmly welcome new participants who have just discovered Moon Beach. The unique programs – especially the family camps – draw many people from the United Church of Christ, and many others from other faith backgrounds.